Of all the travel preparation tasks to take care of before leaving on vacation, packing is the one I dislike the most. Especially because we pack light, I have anxiety that I’ll forget something important and have to go with it for a week or more. We’ve got our routine down to a science now, so we don’t have to go through the same packing worries as before. That’s because I’ve found the best travel toiletry bag and I leave it packed up in between trips. Now when we go somewhere, which is frequently, we just pack the already-filled toiletry bag and don’t spend even a second worrying that something got left out. Brilliant, right? 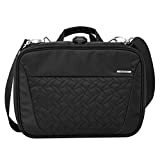 Whether you travel frequently and don’t want the hassle of packing a toiletry bag every time, or you just want to have all of your toiletries and accessories in one neat pack, this list will help you find the perfect bag for you. Want to know what to pack in that toiletry bag? Why not try these eco-friendly toiletries? 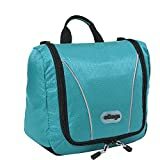 In case you don’t have a lot of time to read all of the reviews below and you’re just looking for a list of our favorite toiletry bags for travel, we’ve put together a quick-pick list for you, Everyone’s needs vary, but you should be able to find a perfect toiletry kit in this list that suits your needs. In my opinion, a toiletry bag is an essential piece of luggage. Without it, you’d likely be packing your personal hygiene products, make up, and hair accessories in a bunch of different bags, or even stuffed into a plastic ziplock bag. There are so many reasons for using a toiletry bag instead. Here are a few of the top reasons you should have one. The best toiletry bags have oodles of organizing pockets and sections so everything stays in its place. I actually wish my purse had this much organization. Routing around in a bag for something hiding in the deepest darkest corner is a real drag. Whether you leave your toiletry bag packed up or clear it out after each time you use it for travel, it provides a really easy way to pack your bathroom stuff. I personally leave it packed up. Then all I have to do is toss it into my bag. No worries. Every one in a while, despite our best efforts, a bottle of shampoo will burst in the bag, or a plate of eye shadow will crack and colored powder goes everywhere. If these items are contained in an easy-to-clean toiletry bag, it’s unlikely that any clothes or expensive gear will get ruined when a spill happens. Plus, it’s super easy to clean. The perfect bag is not the same for everyone. You might be a light packer, like me and want the smallest bag you can find, or you might be a heavy packer and want as much space as possible. While there’s really no one-size-fits-all toiletry bag, there are a few things you should look for in a great bag. ). Also, you can easily return items through Amazon, in case you find a bag just isn’t for you. Best for: Organized travelers, 7-10 days of travel. My personal favorite toiletry bag is the Pack-it-Flat toiletry kit from eBags. It’s small and compact – perfect for a light packer. It’s also a fantastic hanging travel toiletry bag, because the center part opens up as a flap with a hanger on it, so you can hang it wherever is convenient. When we went on a cruise, that feature definitely came in handy, because there wasn’t enough space in the bathroom to put the bag on the counter top. The eBags kit has just the right amount of space and sections to store all of the little stuff. In the center section, there are two pockets made of strong netting that stretch to fit tall things like and makeup, combs, toothbrushes. There’s a plastic, fully-covered zippered pouch that holds smaller items like medicine, nail clippers, jewelry, or hair accessories. The flap also has a zippered pocket made of mesh. We’ve found it’s a great place to put medications that you want to be able to locate easily. On either side of the bag are extra, long zippered pockets. The left side has one large pocket. The right has two pockets. One section has an expandable pocket, so it opens out to be quite large. The other is much smaller. We use one large pocket for our bigger items, like deodorant, sink detergent packs, bottle of Advil, etc. The other is where we store all of our charging cables and power adapters. Pros: Thin and light. Expandable. Really durable. Cons: Large bottles don’t fit. Side pockets have no added organization features. Best for: Light packers. Quick trips of 3-6 days. If you don’t like all the pockets and mesh and loops of the other bags on this list, you might prefer the low-fuss factor of this Eagle Creek bag. It’s a duffel-style toiletry bag that’s easy to just toss things in and go. If you don’t need to pack a bunch of stuff, this bag is the easiest to use, by far. It’s pretty small, by toiletry bag standards. Keep that in mind when purchasing. It’s only 4×10″. So you can only really fit the essentials. Eagle Creek is a trusted brand. They make all kinds of travel organizers and bags. I find them to be very durable and high-quality products that you won’t have to replace any time soon. The material this bag is made of, Silnylon Ripstop, is very lightweight and practically see-through, but it won’t rip or snag easily. Also, the zippers are high-quality and durable. Pros: Durable. Lightweight. No fuss. Cons: Zero internal organization. Too small for most travelers. Best for: Ultra-light packers. Quick trips. I was just saying to myself that I needed to find a smaller toiletry bag for the weekend trips I take where I don’t need as much stuff. But I still want it to be well organized. This Gravel compact toiletry bag fits the bill. There are six pockets in this organizer, and a couple of them are even waterproof. I can fit everything I need for a weekend trip (makeup, toothbrush, deodorant, medications, hair and jewelry accessories, chapstick, and even a few extras. The bag opens with a center zipper, lengthwise. When full and closed, it measures about 2.5 inches thick. There are a few outside pockets to stash things, plus a zippered pocket that holds an adjustable strap and buckle, so you can hang up the bag, or even attach it to other pieces of luggage, if you don’t want to put it inside a bag. The sleek and smooth material the bag is made of is also waterproof, so you don’t have to worry about spills or rain and it’s very easy to clean if a mess does occur. The bag may be a bit too small for all but the lightest of packers. If you like to keep your toiletries streamlined, there’s plenty of space for everything (though I found the toothbrush pocket a little too small for my liking – my husband and I often travel together and I can’t comfortably fit 2 brushes in), and you’ll need to pack 3 oz liquid bottles separately. What I really like about the bag is that everything has its own pocket, stays neatly organized, and is protected by waterproof pockets and sturdy zippers. Gravel’s compact toiletry kit was launched through an Indegogo campaign and their success has spurred another campaign to fund a larger toiletry bag for those who prefer to take along a few more items. You can check out the campaign here. Pros: Waterproof pockets, durable material, sleek and streamlined. Cons: Too small for most travelers. Toothbrush pocket too small. The Portage Toiletry kit is a great choice if you tend to pack bottles of product. It sits flat on the counter and has a large space in the center section for bottles, with mesh pockets to hold everything in place. Inside the main compartment, there’s a zippered pocket for smaller items that might get lost easily. As the bag opens in a U shape, the space is fully utilized. On the flap that opens up are a few elastic bands where you can store things like toothbrush, razor, and makeup tools. Above that is a mirror and another small, shallow pocket. The bag has a detachable hanger, in case you want to hang it up, but it’s best when set on the counter top. The Portage toiletry kit comes in 3 different sizes, so you can choose the one that fits your situation. I prefer the medium size, because you can fit everything you’d need for a week’s worth of travel – a typical vacation length for most people. Do keep in mind that you can’t take products through security at the airport in this bag. It’s more appropriate for trips that don’t involve flying. Pros: Comes in multiple sizes. Sits on counter top. Cons: Can pack it on the plane with bottles inside. I like the AmazonBasics toiletry bag because it’s the happy medium between the eBags Pack it Flat and the larger Portage bag. The Amazon bag is made with a durable polyester and has an internal lining to make cleaning easy when something inside spills. It makes a great mens travel toiletry bag due to its rugged exterior styling. It looks more like a camera bag or electronics case than a toiletry bag. 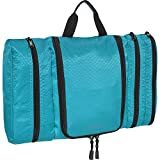 If you’re looking for a medium-size hanging travel organizer with space for travel-size bottles, but not so big that it takes up a lot of room in your luggage, this one is fantastic. It has one large main compartment with mesh dividers, plus a zippered front pocket. There are two compartments on either side that are perfect for razer, comb, toothbrush. And on the flap, there are two more pockets, one with a zipper. Tons of space, but still fairly compact. And for a very affordable price. If you’re looking for a really nice looking, traditional “Dopp Kit”, you’ll love the premium, vintage design of this Vetelli leather toiletry bag. It’s reminiscent of the first dopp bags constructed by Charles Doppelt himself. It’s not genuine leather – it’s synthetic leather, as many bags are today, so take that into consideration. It has a nylon inner lining and waterproof bottom to protect against spills. It also comes with two mini plastic bottles for travel. The bag has two compartments. The main compartment is perfect for storing shaving accessories, product bottles, or basic bathroom supplies for travel. The bottom section zips open to reveal a lower compartment that has a two mesh compartments and a larger, open space. Plenty of room for everything you might want to store, both at home, or for travel. We did find that the zippers weren’t up to quality standards we’d expect from a bag of this price. Otherwise, it’s a nice bag, looks nice, very functional. Pros: Nice, vintage design. Organized compartments. Cons: Made from synthetic leather. Zippers aren’t great. Sometimes leather is just the way to go. This Timberland leather toiletry kit is a great choice. It’s made with genuine leather (dry clean only). It’s also just about as simple as it can get. Great for mens toiletries or hair products. Nick uses one for his hair cutting supplies at home. There are many uses, because the center pocket is just one large compartment. There’s also a zippered exterior pocket for smaller items that might get lost inside. The full dimensions of the bag are 10.2 x 6 x 5.7 inches. It’s a good quality, well-constructed bag that will last a lifetime if well taken care of. The bag also comes in a couple of different colors and materials. There’s even one in canvas, or one with a rugged black leather look. Pros: Simple, useful bag for men. Made with real leather. Cons: Small. Doesn’t look as high quality as expected. Best for: Families. At-home storage. Long road trips. This toiletry bag is a whopper of a bag. It can fit more things that I even have in my bathroom at home. If you’re that person who likes to have everything you might need along on your trip, this is the bag for you. I think it would be awesome for large families traveling, because everyone’s stuff can be packed into one handy organizer. I do like how the bag folds together in the middle. That allows it to be easily packed flat in a suitcase. As for pockets, yes it’s is extremely organized, so there are a ton. But that doesn’t mean the space is so divided up that there’s no room for larger items. A couple of the internal pouches are even removable, so you can pop them out and take them with you. This is great for a day at the beach, or if you’re going to the spa.As you can imagine, the construction of a bag that can fit so much has to be really good. The mesh is durable, and the zippers seem to function really well. The hanger at the top is sturdy, although I worry about its durability over time, when the bag is packed heavy. Nothing has broken yet. Because the bag is so large – it has FOUR full compartments, it really benefits from the double handles and heavy-duty shoulder strap. Pros: Tons of space. Great organization. Removable pouches. Cons: Only available in one size, which is too large for most. If you pack it full, it is incredibly heavy. I hope you were able to find the right bag for you on our list. 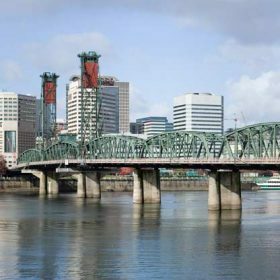 There are many choices on the market today, so it can be understandably difficult to discern between all of them. If you have a great toiletry bag that you use, tell us about it in the comments. I love to hear what everyone is using. Like this post? Why not share it on Pinterest?! I always wanted to keep my things organized, specially when packing for a travel! Glad a friend of mine recommended me roadeavour’s travel toiletry kit, It makes packing easier!